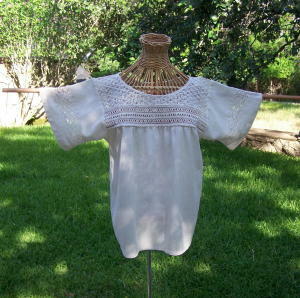 breezy blouse in natural unbleached cotton. It hangs beautifully. 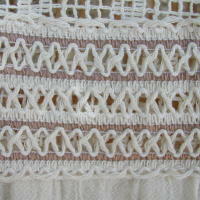 It is soft, and washes with ease. The seams are wonderfully done. 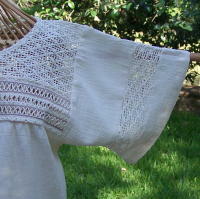 voluminous folds that make this a peasant blouse. Your blouse will fit best if your bust measures 38" - 42"
Small - best fit 36" to 42"
Bust gathers open to up to 44"
Medium - best fit 42" to 46"
Bust gathers opens to up to 48"
Large - best fit 48" to 54"
Bust opens to up to 56"
XL - best fit 56" to 62"
Bust opens to up to 66"